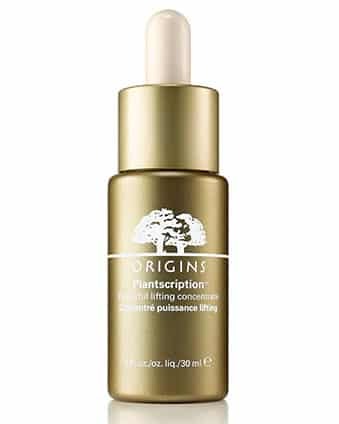 The Plantscription Powerful Lifting Concentrate is the latest offering from Origins and is a serum designed to help with skin firmness, photo ageing and elasticity. The 2 feature ingredients are Anogeissus and Commiphora. Anogeissus extract can actually be found as a registered patent here that it can be used for treating human skin by producing fibrillin and thereby increasing skin elasticity. The ingredient is effective when used with a carrier, which you’ll find plenty of in this se!rum. Unfortunately, the carrier they’ve used is Butylene Glycol, which although isn’t bad, could be better – it’s an alcohol derivative. However, the base is still that of water and Acacia gum so it feels very hydrating and softening. 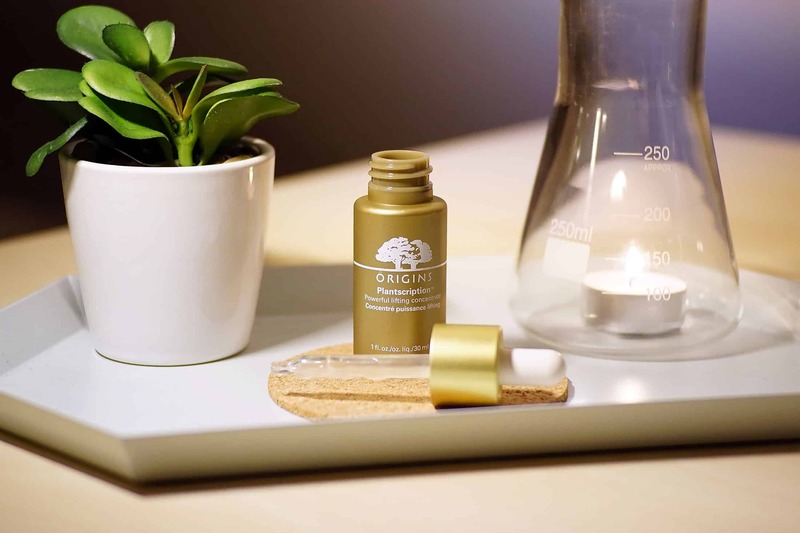 Commiphora, the second of the two power ingredients, comes from a flowering plant in the frankincense and myrrh family – creating skincare of biblical proportions? This ingredient aids stimulation and helps to increase surface blood flow whilst tightening surface skin layers. It’s also a great antimicrobial! To be honest, I’m more impressed by the rest of the ingredients, a seriously rich and powerful blend of some of my favourite essential oils which you can find in the list below. These also help the Plantscription Powerful Lifting Concentrate smell absolutely amazing! In use, it sinks into the skin without a trace and I’d say is great for all skin types with concerns of either wanting to improve the appearance of sagging or to help stave it off. As mentioned, the carrier is Butylene Glycol so make sure you use a good moisturiser on top that has lots of hydration – oil rich for dry skin and water-rich for oilier skin. Don’t expect miracles. If you’re really worried about sagging, look for something more heavy duty like a professional peel or similar. But remember, the best way to stave off loss of elasticity is to use an SPF every single day, even in Winter – if you can see in natural light, there’s UVA/UVB that will damage skin. Water, Acacia Senegal Gum, Butylene Glycol, Rosa Damascena Flower Oil*, Lavandula Angustifolia (Lavender) Oil*, Pelargonium Graveolens Flower Oil*, Illicium Verum (Anise) Fruit/Seed Oil*, Citrus Aurantium Bergamia (Bergamot) Fruit Oil*, Carthamus Tinctorius (Safflower) Seed Oil*,Myristica Fragrans (Nutmeg) Kernel Oil*, Citrus Aurantium Dulcis (Orange) Peel Oil*, Citrus Nobilis (Mandarin Orange) Peel Oil*, Citrus Limon (Lemon) Peel Oil*, Litsea Cubeba Fruit Oil*, Hibiscus Abelmoschus Extract, Linalool, Citronellol, Limonene, Geraniol, Citral, Methyl Gluceth-20, Glycereth-26, Commiphora Mukul Resin Extract, Porphyridium Cruentum Extract, Prunus Amygdalus Dulcis (Sweet Almond) Seed Extract, Algae Extract, Sigesbeckia Orientalis (St. Paul’s Wort) Extract, Bambusa Vulgaris (Bamboo) Extract, Centaurium Erythraea (Centaury) Extract, Crithmum Maritimum Extract, Coffea Arabica (Coffee) Seed Extract, Cynara Scolymus (Artichoke) Leaf Extract, Rosmarinus Officinalis (Rosemary) Leaf Extract, Solanum Tuberosum (Potato) Pulp Extract, Anogeissus Leiocarpus Bark Extract, Caffeine, Squalane, Pullulan, Pisum Sativum (Pea) Extract, Acetyl Hexapeptide-8, Laminaria Digitata Extract, Micrococcus Lysate, Sodium Hyaluronate, Hydrogenated Vegetable Oil, Oleth-3 Phosphate, Caprylic/Capric Triglyceride, Caprylyl Glycol, Glycerin, Bisabolol, Oleth-3, Hydroxypropyl Methylcellulose, Oleth-5, Tocopheryl Acetate, Carbomer, Peg-75, Xanthan Gum, Tetrahexyldecyl Ascorbate, Glucosamine Hcl, Sodium Hydroxide, Sodium Dehydroacetate, Hexylene Glycol, Lecithin, Disodium Edta, Phenoxyethanol. *Essential Oil. This article first appeared on MANFACE written by Thom Watson. It was published on Wednesday 25th January 2017 and was last updated on Monday 3rd April 2017 at 12:31pm. It's categorised under Origins where you'll find more related content.